After the rousing success of Trump the Press, which lampooned the pundits who missed Trump’s nomination, Don Surber’s readers demanded the story of the 2016 general election. Eager to please his fans and have some fun, Surber agreed to tear into the elitists a second time. Trump the Establishment uses Surber’s quick wit and deep research to chronicle President Trump’s spectacular rise. Trump’s was an asymmetrical campaign that fooled critics and pleased his supporters. From Clinton’s questionable activities to the media’s inability to grasp the difference between Trump the celebrity and Trump the CEO, Surber shows how Trump challenged and beat the establishment on his own terms. Voters in thirty states chose to dump the status quo in Washington, and Make America Great Again. Trump won despite Clinton’s massive campaign war chest. He won despite overwhelmingly negative news coverage. He won despite losing every debate. He won despite a tumultuous personal and financial past, and still, the elitists don’t understand why. Surber explains why. Just don’t expect him to have any sympathy for the elitists and media personalities left adrift and defeated in Trump’s passing. And after all, why should he? 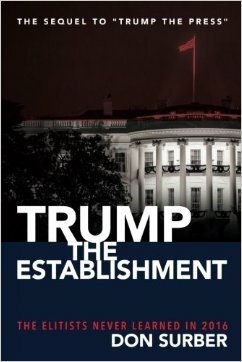 Trump The Establishment is available in paperback on Amazon. The Kindle version is slated for release in early March.